Figure A. A647 conjugated Rat anti Canine CD4 (MCA1038A647) and RPE conjugated Rat IgG2a isotype control (MCA6005PE). Figure B. A647 conjugated Rat anti Canine CD4 (MCA1038A647) and RPE conjugated Rat anti Canine CD5 (MCA1037PE). All experiments performed on red cell lysed canine blood gated on mononuclear cells. Figure A. FITC conjugated Mouse anti Canine CD3 (MCA1774F) and purified Rat IgG2a isotype control (MCA6005) detected with Goat anti Rat IgG2a DyLight 649 (STAR71D649). Figure B. FITC conjugated Mouse anti Canine CD3 (MCA1774F) and purified Rat anti Canine CD90 (MCA1036GA) detected with Goat anti Rat IgG2a DyLight 649 (STAR71D649). All experiments performed on red cell lysed canine blood gated on mononuclear cells. Figure A. A488 conjugated Rat anti Canine CD44 (MCA1041A488) and RPE conjugated Rat IgG2a isotype control (MCA6005PE). Figure B. A488 conjugated Rat anti Canine CD44 (MCA1041A488) and RPE conjugated Rat anti Canine CD45R (MCA1043PE). All experiments performed on red cell lysed canine blood gated on mononuclear cells. Figure A. RPE conjugated Rat anti Canine CD45R (MCA1043PE) and A488 conjugated Rat IgG1 isotype control (MCA6005A488). 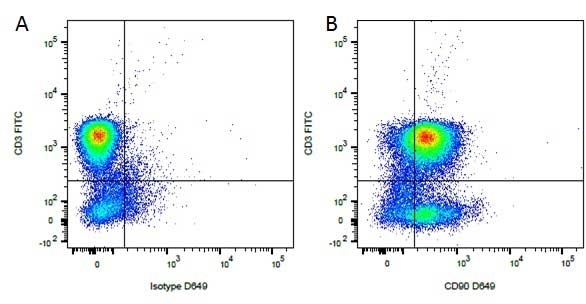 Figure B. RPE conjugated Rat anti Canine CD45R (MCA1043PE) and A488 conjugated Rat anti Canine CD44 (MCA1041A488). All experiments performed on red cell lysed canine blood gated on mononuclear cells. Rat IgG2a isotype control for measurement of non specific binding of rat monoclonal antibodies. This antibody recognizes trinitrophenol (TNP). Rat IgG2a negative control, a rat monoclonal raised against trinitrophenol, is recommended for use as a negative control to assess the level of non-specific binding of rat IgG2a test antibodies to the surface of human and mouse cells in flow cytometry. 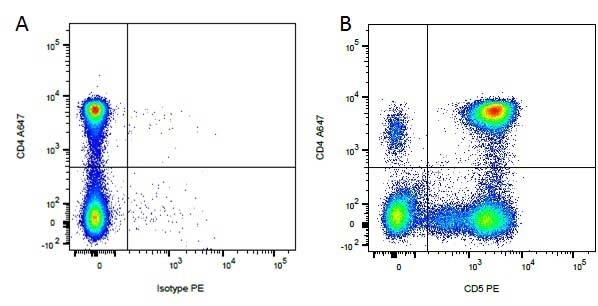 Test results have shown that this antibody is also suitable for use as a negative control with porcine and canine cells. Avoid repeated freezing and thawing as this may denature the antibody. Storage in frost-free freezers is not recommended. This product should be stored undiluted. This product is photosensitive and should be protected from light. Should this product contain a precipitate we recommend microcentrifugation before use. 18 months from date of reconstitution. Where this antibody has not been tested for use in a particular technique this does not necessarily exclude its use in such procedures. *This antibody should be used at the same concentration as the test antibody.